At left, Francisco Candido of Visitation B.V.M. Parish in Philadelphia prays with other Hispanic leaders at a day-long session for local participants of the V Encuentro process Jan. 20 at St. Peter the Apostle church, Philadelphia. More than 380 people involved in Hispanic ministry in the Philadelphia Archdiocese came to St. Peter the Apostle Church in Philadelphia on Saturday, Jan. 20 for an all-day session of V Encuentro, the nationwide planning process for Catholic Hispanic ministry. 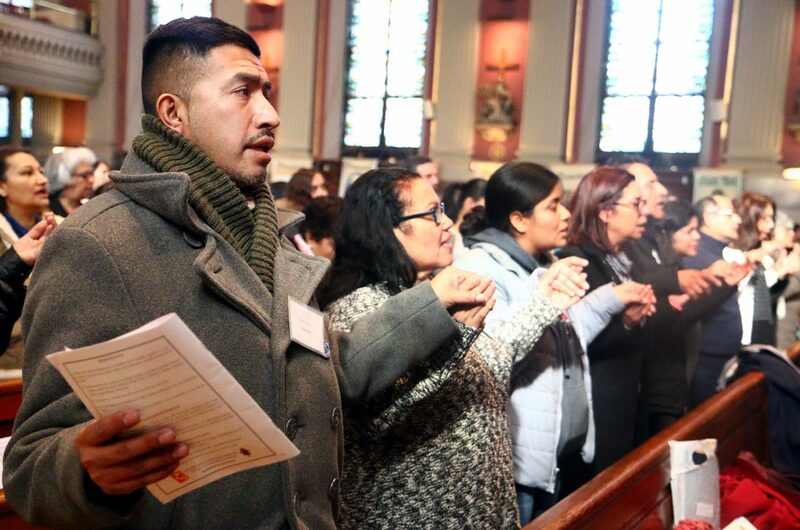 Of the 36 parishes in the Archdiocese of Philadelphia with a significant Hispanic population, 30 sent between five and 10 delegates to the meeting, joining staff and other workers in the ministry. Archbishop Charles Chaput, along with the four auxiliary bishops of Philadelphia, 12 priests and 11 deacons, celebrated Mass at midday for the group then stayed for a luncheon afterward. The goal of the V Encuentro is to discern ways in which the Catholic Church in the United States can better respond to the presence of Hispanics and Latinos, and to help them respond to the new evangelization as missionary disciples serving the entire church. The Philadelphia archdiocesan group is similar to ones working together in most dioceses to consult on a new pastoral plan for Hispanic ministry, updating the one last developed in 1982. V Encuentro’s two-year-long process of consultation and planning among Hispanic Catholics is intended to form the beginning of a new pastoral plan. “We’re almost finished the final step in the process” which has been marked by meetings “in stages (and) at various points in the year,” said Kathia Arango, director of the archdiocesan Office for Hispanic Catholics. At the Jan. 20 meeting at St. Peter’s, two speakers offered valuable information about the process to the Philadelphia delegates: Deacon Asterio Velasco from Newark, N.J., who is chair of the V Encuentro process in Episcopal Region 3 and director of Hispanic ministry for the Archdiocese of Newark; and Andres Arango, a member of the National Team of the V Encuentro and director of Hispanic ministry and evangelization for the Diocese of Camden. After a U.S. regional meeting this April to be attended by 50 delegates from Philadelphia, 17 local delegates will attend a national V Encuentro meeting in Texas this September. The results of that meeting, together with recommendations from thousands of Hispanic Catholics who have been engaged in the process for the past two years, will inform a new pastoral plan for Hispanic ministry and evangelization by 2019.